The East Tower project consisted of building three new stories on top of an existing two-story structure. The first floor of this structure was the Emergency Department. All work had to be completed in a manner that would not disturb the Emergency Department, which remained in operation 24 hours a day, 7 days a week. This project consisted of multiple spaces within the existing hospital, which included Pediatric Surgery, Central Sterile, Pharmacy, Engineering, L&D Triage, E.D. Exam Rooms, Breast Health, 3rd Floor West Tower, 3rd Floor Nursery and Lithotripsy Renovation. 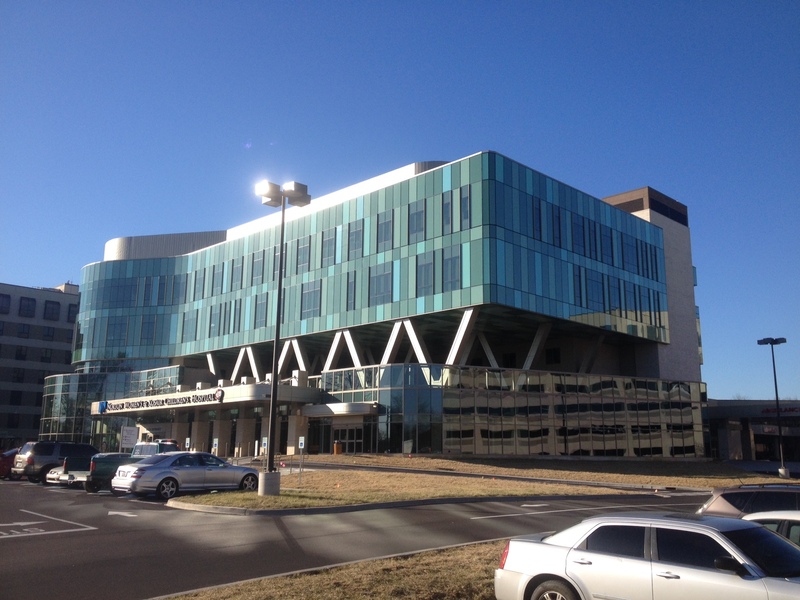 Expansion projects included the ICU, OR & PACU expansions and the addition of the East Tower. Project Size: Renovation=60,000 sq. ft. / Expansion=155,000 sq. ft. The KFC YUM! Center is a new multi-purpose arena located in downtown Louisville, Kentucky. This facility will be home to the University of Louisville Men’s and Women’s Basketball programs. Additionally, it is designed to accommodate a wide variety of other events including NCAA championships such as wrestling, swimming and volleyball, as well as concerts, circus, wrestling, boxing and ice shows. The 721,762 square foot facility includes: locker rooms, club lounges and suites, a team store, retail space, a restaurant, sports bar, four meeting rooms, a Norton Immediate Care Center, administrative offices, and KFC YUM Brand and Papa John’s concessions. The Arena seats up to 22,000 guests. Hussung Mechanical installed 3 Chillers totaling 2,850 tons of cooling, 25 air handling units, 3 boilers totaling 20,400,000 BTUH, 90 Fans (return, smoke pressurization, and exhaust), and over 1,000 plumbing fixtures, not including those provided by the kitchen and concession vendors. Bardstown, Kentucky is the new location for NPR Manufacturing, Kentucky – a 195,545 sq ft facility that will produce steel piston rings, one of the key automotive engine components. One of Hussung Mechanical’s LEED Certified engineers experienced the companies first ever overseas job interview which took place in Ichinoseki, Japan and consisted of design meetings for three consecutive days. Hussung Mechanical furnished and installed complete sanitary, storm, domestic water, process water and natural gas systems, plumbing fixtures, packaged rooftop air conditioning and heating units, fluid cooler, cooling tower, pump packages along with process cooling piping, ammonia piping and drain piping. This project was completed with a fast-track design-build schedule and required quick reaction to owner provided information on additional systems as well as additional equipment and piping required for production equipment. A steam system was removed from the original concept for higher efficiency gas heating which resulted in a savings of $214,000.00 plus energy. Hussung Mechanical worked closely with Whittenberg Construction to construct the new state-of-the-art heart center at Floyd Memorial Hospital. Renovations and additions included: a lobby and registration area, operating rooms to perform open-heart surgery, beds for heart surgery patients, treatment rooms, 24-bed MedSurg Unit, Emergency Department, Women’s Center and a new Laboratory. Hussung Mechanical worked with the design team and owner to develop a phasing plan for installation of new equipment with minimal interruption to the owner and without compromising patient care. Hussung Mechanical installed: two large VAV air handling units (140,000 CFM and 100,000 CFM), a 20,000 square foot constant volume air handling unit, two new 750 ton chillers, new cooling towers, a new primary/secondary pumping system, 350 BHP fire-tube steam boiler (interconnected with the three existing steam boilers to supplement the 100lb. steam system) and a new central oxygen park, medical air compressor, and domestic water softening system. Hussung Mechanical employed 32 Plumbers and 24 Pipe-fitters at its peak and completed this project in 18 months. Barret Middle School is a three story traditional school that was in need of HVAC renovation. Like most schools in Jefferson County, repairs of this extent had to take place during summer break, which meant that Hussung Mechanical had approximately 10 weeks to complete this project. With 25 plumbers and pipefitters working 6 days a week, Hussung Mechanical replaced 4 boilers, 7 air handling units and 6 pumps. Also, 67 Fan Coil Units and 39 unit ventilators were installed, in each classroom, for individual temperature control. In order to accommodate the renovation of the HVAC system the electrical scope of work included routing power to all new mechanical equipment along with other associated electrical system renovations. This challenging project required meticulous planning and coordination, from Hussung Mechanical, of 22 subcontractors and vendors. The 10 week time frame also included asbestos removal, demolition of existing HVAC, plumbing, and electrical systems. Approximately 15,850 feet of piping (3 miles) had to be removed and replaced; the majority of this piping was located in 4-foot high tunnels and crawl spaces underneath the first floor of the building. All electrical switch gears, main transformers, and electrical service to the building had to be replaced. Temporary power was required for 5 weeks. This challenging project required meticulous planning and coordination, from Hussung Mechanical, of 22 subcontractors and vendors. In the new Biomedical Research Facility, Hussung Mechanical installed five custom built air handling units ranging from 75,000 to 100,000 CFM. Each unit consists of four separate tunnels that can operate independently. There is an additional 15,000 CFM unit to serve the BSL3 Lab on the sixth floor. Ten laboratory exhaust fans were installed in conjunction with two energy recovery units. The office areas are served by VAV boxes with reheat coils while the lab areas utilize Phoenix supply valves with reheat coils. Phoenix exhaust valves were installed for lab general exhaust and fume hood exhaust. Lab gasses, vacuum and water were provided throughout the lab areas to work stations and fume hoods. The basement area of the new facility is devoted mostly to animal holding and procedure rooms. These areas have extensive automated air pressurization and lighting controls. Also serving this area is an automatic animal watering system. To aid in LEED certification, low flow flushometers were installed on all closets and urinals. AHU condensation and rain water is collected to a harvesting system utilized to provide site irrigation. An Aircuity Optinet Facility Monitoring System was installed to intelligently control each room’s airflow in order to increase safety and minimize energy use. With their “no bad job” culture, HMC is always willing to help a client reach their specified goals. And when approached about budget restraints in the Jewish Hospital project, HMC value-engineered over $830,000 out of the job to keep the owner within budget. The Jewish Hospital Medical Center East project involved the installation of HVAC, plumbing, medical gas, and fire protection systems for the new building. At 190,000 square feet, this medical facility features eight operating rooms, Endoscopy, CT, MRI, pre- and post-op areas, treatment areas, and doctor offices. Completing this fast track project was no small feat and required a crew of approximately forty craftspersons on site to complete within the thirteen month schedule. 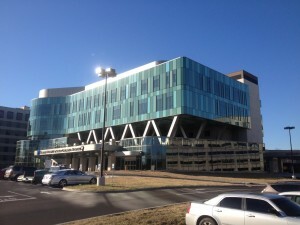 The dedication to meeting their client’s schedule targets allowed HMC to complete the Courthouse Complex in Louisville on an extremely tight schedule. At 283,000 square feet, the Courthouse Complex houses twelve circuit and nine family court divisions as well as offices for the state Court of Appeals judges and the Kentucky Supreme Court justice from Louisville. Although the project engineer was based in Illinois, HMC engineers redesigned the entire HVAC and plumbing systems for the Courthouse Complex to meet budget constraints and state and local code requirements. For the renovation and expansion of the Convention Center in downtown Louisville, the services of HMC were utilized to complete the plumbing for restrooms and piping for floor ports in the exhibit hall. The floor ports were equipped for vendor hook-ups consisting of air, water, and drain piping. Our construction team faced the challenge of installing the majority of their work off of manlifts as the majority of the work was in the ceiling of the first floor. At 144,000 square feet, the new exhibit hall of the Convention Center joins the old building both over and under Third Street via crosswalk and tunnel. Knowing the importance of basketball in Kentucky, HMC was not about to deny Western Kentucky University their season opening game. With this critical deadline, HMC completed the E.A. Diddle Arena project in eight months allowing WKU to host their season opener. The E.A. Diddle Arena renovation project included all new mechanical and plumbing systems and the installation of new underground plumbing systems, air conditioning and ventilation systems, a boiler room, air-cooled chillers, and a building automation controls system. HMC was also involved with the new 43,000 square feet sports administration area, which included a practice gym, weight room, hydrotherapy room, sports administration offices, and new locker rooms. At the peak of this project, HMC had twenty-four plumbers and twenty-seven pipe fitters on the job, as well as a superintendent, plumbing foreman, pipe fitting foreman, project assistant, and project manager. The project posed a unique obstacle for the construction team. The excavation of the floor inside the arena included rock that extended to just under the floor in some areas requiring the rock to be blasted inside the existing building. At 770,000 square feet, the Downtown Louisville Marriott Hotel is the largest convention hotel in the city. This hotel/convention facility includes 620 guest rooms, two restaurants, lounges, ballrooms, meeting facilities, laundry, pool, and parking facilities. HMC was assigned to the Marriott Hotel project with the objective of completing the tasks of HVAC, plumbing, and fire protection. In the early phases of the project, the team helped the client overcome budget problems. With their experience in value engineering, HMC was able to save the owner over $500,000 in mechanical system installed costs. At its peak, the Marriott Hotel project had a crew of approximately fifty people. Faced with a large project and demanding schedule, HMC was still able to complete this project within schedule in a period of twenty months. With the Churchill Downs project the fate of Derby 2004 and 2005 hinged on HMC’s reputation of completing projects on schedule. The HVAC and plumbing of the first and second floor levels of the new Churchill Downs building needed to be finished before Derby 2004 and the remainder third through sixth floor levels for Derby 2005. As expected, HMC completed the project in time for both Derbies. The Churchill Downs project involved the demolition of the existing buildings and the addition of new grandstands, suites, Jockey Club suites, kitchens, lounge areas, press rooms, and a central heating/cooling plant. The Churchill Downs project presented some unique obstacles. In order to avoid noise in the early horse training hours, work hours were shifted. The project also required two shifts working between the spring and fall meets to ensure the project maintained the construction schedule. The crew consisted of as many as fifty people including plumbers, pipe fitters, and sheet metal and insulation workers and took two years to complete. Currently, HMC Service is performing maintenance on this building.